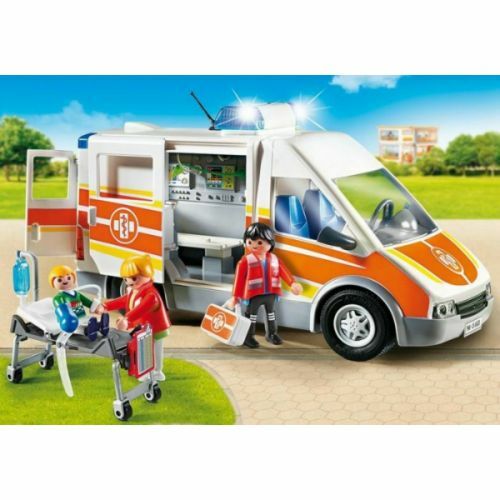 Race to the rescue with the Ambulance with Lights and Sound. Clear the roads with the functioning lights and siren (1 x AAA battery required) to arrive at the scene as fast as possible. The removable roof, sliding side door, and back doors make it easy to get the patient into the ambulance and head for the hospital. Once the patient is securely placed on the stretcher, it can slide right into the back off the ambulance thanks to the collapsible legs. 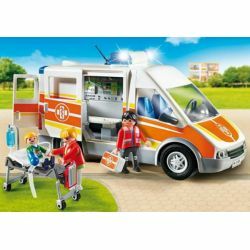 Set includes two adult figures, one child figure, ambulance with lights and sound, stretcher, bandages, stethoscopes, medical kit, and other accessories. Combine this set with the Furnished Children's Hospital (6657 – sold separately) for added play. Dimensions: 10.6 x 5.1 x 5.5 in (LxWxH).